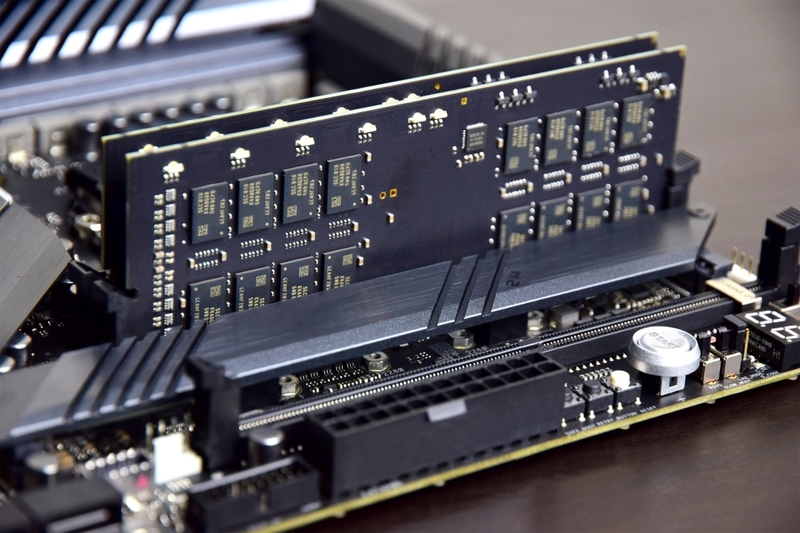 The big picture: Double height DDR4 doesn't seem to exhibit any significant performance shortcomings although given its limited compatibility and pricing, there's not really much reason to buy it unless you absolutely need the extra capacity. Double height DDR4 modules started making noise last year, promising benefits to both small form factor builders and those with the need for more than 64GB of total memory (assuming your platform of choice supports it). True to their name, these modules offer double the capacity of a standard DDR4 module – so up to 32GB per stick. To make room for the additional ICs, however, the height of the modules has been increased. If you’re concerned about CPU cooler clearance, it’s something you’ll want to consider beforehand. AnandTech recently hosted two of these new kits on its test bench – the 2x32GB G.Skill TridentZ RGB DC DDR4-3200 CL14 (1.35V) and the 2x32GB ZADAK Shield RGB DC DDR4-3200 CL14 (1.35V) – using an ASUS ROG Strix Z390-I Gaming (BIOS Version 1003) motherboard and an Intel Core i7-8700K, comparing them to a trio of 2x16GB kits. Notably, only three motherboards are currently validated for use with double height memory: the aforementioned Strix board, the ASUS ROG Maximus XI Apex and the ASUS ROG Maximus XI Gene. Using 8 Gb Samsung B-die chips, a normal 16 GB module would have 16 of them to make it up to capacity. For these modules, to reach 32 GB per module, there are 32 x 8 gigabit chips. These are split into two ranks of sixteen chips, and act as if there are two memory modules on the same channel. Modern mainstream processors support 'two DIMMs per channel', meaning two memory modules per channel, which is why we see motherboards for dual channel processors have a total of four slots. By putting two modules onto one PCB, only one slot is needed to hit 'two DIMMs per channel'. In testing, AnandTech found that performance was consistent across both kits and on par with G.Skill's TridentZ RGB DDR4-3200 standard 2x16 GB kit. Surprisingly enough, the double height design with its longer traces from the ICs was even beneficial in some scenarios. It would seem that the only real benefit to going this route is if you absolutely need the additional capacity. Even then, only a few boards and kits are available and you’re going to pay about the same price of what the equivalent capacity would cost in “standard” sized sticks. ZADAK, for example, said its baseline DDR4-2666 CL16 kit will start at $799.